Provocations by US-trained militants groups using chemical weapons will serve as a pretext for the United States to attack Syria, and Moscow has seen corresponding preparatory moves, including the formation of naval strike groups, the Russian General Staff has said. "We note the evidence of preparation for possible attacks. Strike groups of naval carriers with cruise missiles are being formed in the Eastern part of the Mediterranean, in the Persian Gulf and in the Red Sea," chief of the Main Operational Directorate of the Russian General Staff Col. Gen. Sergey Rudskoy said. He stressed that it is unclear, who the US wants to support in this case, Jabhat al-Nusra* terrorists or their allies terrorizing Eastern Ghouta. According to Rudskoy, militants of the al-Nusra Front from Eastern Ghouta have recently intensified the shelling of Damascus, the army is now conducting operations to eliminate the terrorists. "Jabhat al-Nusra militants along with the White Helmets are preparing a staged chemical attack in the Alghabit and Kalbb Lusa communities situated 25 km (15 miles) to the North-West of Idlib. There are 20 chlorine containers in their possession," said the Russian General Staff. The General assured that such an incident would be widely broadcasted in foreign media. 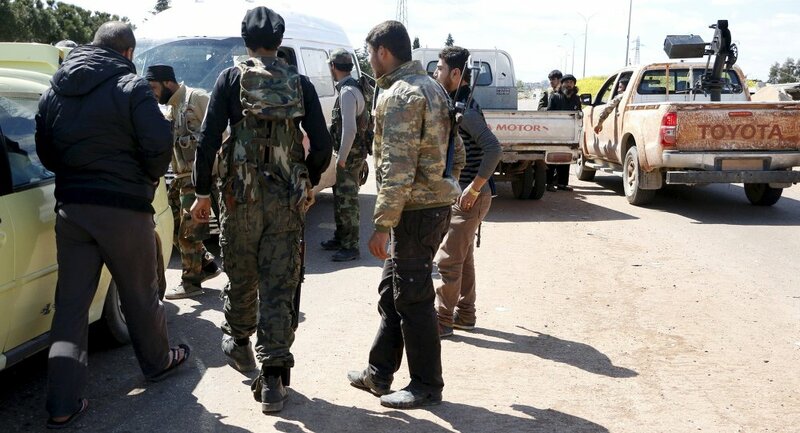 "In the area of the city of At-Tanf, American instructors have prepared several groups of militants to carry out provocations in the south of Syria," said Rudskoy. According to Rudskoy, the toxic agents have been delivered to southern Syria under the guise of a humanitarian aid convoy. Rudskoy noted that the provocations were also aimed at creating a pretext for US strikes against Syrian government. Earlier, US Envoy to UN Nikky Haley threatened with Washington's strike against Damascus in case the chemical weapons use in Syria. "Tomorrow, another UN humanitarian convoy, consisting of 25 heavy vehicles will head to Douma in order to assist the city’s population," said the Russian General Staff. More than 44,000 people left Damascus' suburbs of Eastern Ghouta through the humanitarian corridors, Col. Gen. Sergei Rudskoi said. "Today one can say that the situation in Eastern Ghouta has radically changed. Right now you are witnessing a humanitarian operation of a unique scale. Just today, 26,610 civilians left [Eastern Ghouta] through the humanitarian corridor, while the entire number of people, who’ve left Eastern Ghouta, has reached 44,639," Rudskoi said. Rudskoy said that three United Nations humanitarian convoys had made it to Eastern Ghouta over the past week. The people in need have received 445 tons of food, essentials and medicines. The situation in Eastern Ghouta has been complicated over the past weeks, as terrorists continue to shell the area. On February 24, the UN Security Council unanimously adopted Resolution 2401 that urged all conflicting sides to immediately stop all hostilities and adhere to a humanitarian pause across Syria in order to ensure the safe delivery of humanitarian aid, as well as medical evacuation of those injured. Russia also proposed an initiative of organizing a five-hour daily humanitarian pause to ensure humanitarian supplies and evacuations from the area.